Barbie always seeks for new trends and she thinks, she has found a new one! Put on makeup and choose an outfit, that will match your personality! Are you ready for the colorful makeover? 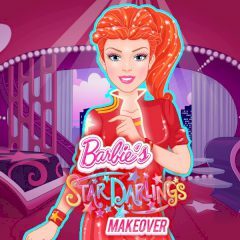 Barbie has something special to offer, but she needs you to try it out. Well, someone should test it first. Maybe you are the one?